Home brewing and craft beers have really taken off in recent years. We’ve certainly noticed more people printing beer labels at Avery WePrint and it is important to get your beer labels right. Home brewing and craft beers have really taken off in recent years. We’ve certainly noticed more people printing beer labels at Avery WePrint. If you’re selling your beer to the public, getting your Product Labels right can be a delicate balance, whether you’re brewing beer as a business or as a hobby. Not only do you need the branding and design of the labels to work, there are also rules, regulations and best practice to take into account. This is why beer bottles normally have two labels – one on the front to ‘sell’ the product and one on the back to give consumers more information and meet the legal requirements. This is why beer bottles normally have two labels – one on the front to ‘sell’ the product and one on the back to give consumers more information and meet the legal requirements. What will make people choose this beer? The answers will help you develop the wording, design and branding. 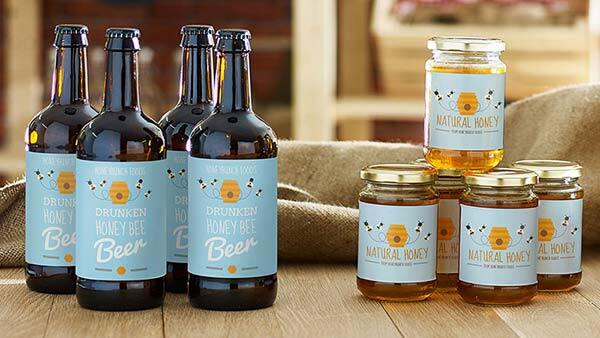 As you may have noticed with the proliferation of micro-breweries and craft beer, labels have become a new art form! Using the Online Design Tool, you can either design your labels from scratch, or upload finished artwork. You can also upload images and combine them with text and shapes using this free online software. For a really professional look and finish, Avery WePrint lets you print right up to the edge of labels and provides a range of high quality label materials including paper, textured paper and plastic. Extra durable labels are designed to be submerged for long periods and are ideal for bottles that are likely to be subjected to especially low or high temperatures, or be submerged for long periods – in buckets of ice, for example. 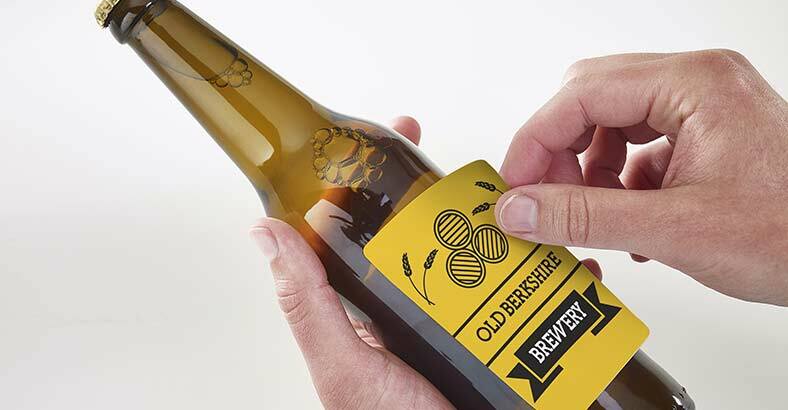 We find that customers generally use rectangle, oval, straight oval or plaque-shaped labels placed lengthways for beer bottles. And our low minimum orders allow for plenty of experiments! In case you’re wondering about what bottles to use, brown glass is usually used for beer made from hops because it filters out sunlight which affects this type of beer. Green or clear glass bottles are most commonly used for beers that don’t contain hops. Certain information is required by law if you’re selling beer to the public. In addition, there are best practice guidelines for the drinks industry. The law requires food and drink labels to be clear and easy to read, permanent, easy to understand, easily visible and not misleading. You can find these regulations on the UK Government website.UK Government website. This is currently in line with EU Regulation 1169/2011 on the provision of food information to consumers. The net quantity of beer in the bottle must be shown in litres, and this information should be shown close enough to the type of beer so that you can see this information all at once. You also need to show alcohol by volume (ABV) and a warning if it’s higher than 1.2% ABV in the same place. Other warnings relate to allergens that can occur in beer – sulphur dioxide at a concentration of more than 10mg per litre or liquorice at more than 300mg per litre. Then there’s the ‘best before’ or ‘use by’ date, and the lot number or ‘use by’ date to include, as well as the ingredients, the name and address of the manufacturer and any special storage instructions. You don’t need to show the country of origin unless your design or name suggests that it was made in a different country. When showing ingredients, they must be shown in order of weight with the main ingredient first. Trading standard laws also affects the sale of food and drink, and there are differences between England, Scotland, Wales and Northern Ireland, so do make sure you’re familiar with the law in your country. The Food Standards Agency also has guidance on labelling alcoholic drinks available here. The UK Chief Medical Officers and the drinks industry have been working together to put drink warnings on bottles of alcohol. See low risk drinking guidelines. By putting the ℮ mark on your label, you can export your product to other countries in the European Economic Area without having to meet weights and measures requirements in those countries. We wish you luck with your beer bottling and labelling. To get started, measure the circumference of your beer bottles to make sure you choose the right size label. Then go to Avery WePrint labels to choose your labels and create or upload your design. Please make sure you refer directly to the latest government guidance. All the information and hyperlinks given in this article were correct and to the best of our knowledge at the time of publishing, but regulations can be complex and they do change over time, and so do web pages.